When we talk about radio apps we tend to mention only the apps for iPhone and iPad, however, Apple TV also have a wide range of different radio apps. So you can easily set the atmosphere in the house with the music that suits your taste and mood, without having to sync your iPhone or iPad. We put together the best radio apps for Apple TV. Using the apps for the Apple TV you can easily use your television as a radio. Most TVs have a special mode that allows you to switch off the picture, but allows the sound through. This mode is specifically designed to listen to music through your TV. And if you have an Apple TV, you can use it just as well to set up your favorite radio station list. myTuner Radio is definitely the most popular radio app for iPhone and iPad and that is no different on the Apple TV. The app offers more than 50,000 radio stations of 200 countries. Not only are the famous ones such as KLBN La Buena, Jazz24, Hot 97 and Power 106FM, but also the specific theme channels and smaller local radio stations. The app has a clear interface and also lets you listen to podcasts. You can view the most popular channels at a glance or use the search function. You can also search by genre, allowing you to tune your music to the atmosphere. Unfortunately, the app does not show which song is playing, but if you have turned off your image, it does not matter much. There is both a free and a premium version. The free version is great if you only want to listen to your Apple TV, but if you want the iOS version right away, you can also choose the paid version without ads and with CarPlay support. Waves – Waves in an Internet radio app receiver that works on Apple TV. Quickly play over 60,000 stations, browse & search by genres, locations and stations names, add lists based on tags and save your favorites. Get info’s about music, artists and stations: find the tracks in Apple Music or Spotify, and info’s on more than 20 other online services. The Bat Player Radio – Listen to your favorite internet radio stations and discover new music, all through your Apple TV. It’s a big screen experience, utilizing the space to present a beautiful interface focusing on details about each song. Old Time Radio Streamer – is a very simple a straightforward way to listen to OTR streams on your Apple TV. With a simple user interface and a simple feature set you should be able to start listening and enjoying fine Old Time Radio content very quickly. There are a lot of other apps that do similar things, however none as simple and straightforward and even better, ad free. 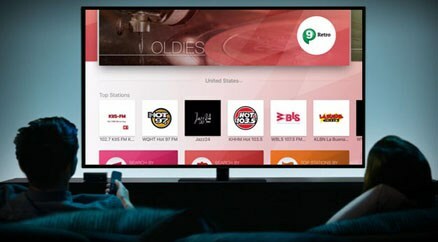 iHeartRadio – offers local AM and FM stations as well as broadcast stations from across the country directly on your Apple TV. There is also personalized radio and all of it is available on the TV. You can even sync your account, so your favorites are available without any extra setup. I prefer and recommend mytuner. It’s really great, especially for those who are abroad and want to listen to their hometown radio stations!